Woodrow Wilson named the first volume of his History of the United States "The Swarming of the English." We might go further and compare the colonization and expansion in the New World to a fissioning process in which individual atoms are torn loose from a former pattern of coherence and fused into new and strange patterns. The United States, indeed, is still in the process of fusion following the earlier fission process. It has not yet reached the stability that comes to some nations in history, and which is marked by a fixed pattern of population growth, land use, day-to-day habits, and philosophic beliefs. It is, rather, a country in which every generation can look back to a strangely different era that existed before it came of age. The period 1625-1660 in Virginia history is an important one for the study of the fission-fusion process in America. During those years Virginia's population increased perhaps twenty-five or thirty fold, and the settlements spread from a thin belt along the James River to the whole of Tidewater Virginia. Human atoms were propelled outwards in every direction in an uncontrolled and only feebly directed expansion. The years 1607 to 1625 had created a base for this expansion. Those had been crucial years and difficult ones. Settlements had resembled military camps and individual colonists had been commanded like soldiers. Rigorous administration of justice, fear of the Indians, and the strict economic regulations imposed by the London Company had served to restrain the potentially expansive nature of the colonists. 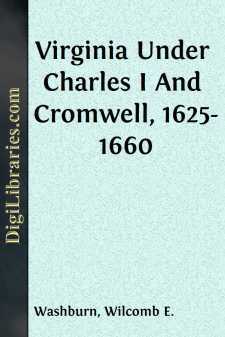 The year 1625 saw Virginia under a new King and under a new form of government. The charter of the London Company was made void, and the colony passed from the control of a commercial company to the direct control of King Charles I. The official census of the non-Indian population of Virginia in 1625 showed 1,232 persons in the colony. Nine hundred and fifty-two were males, twelve of them Negroes. Two hundred and eighty were females, eleven of them Negroes. Although the colony had been in existence for eighteen years the fissioning process had hardly begun. But it was beginning. Five years later the population had more than doubled to approximately 3,000. In 1640 the population jumped to 8,000, and by 1670 to 40,000, of whom 2,000 were Negroes. Every aspect of Virginia life—political, physical, economic, social, and moral—was to be affected by this explosive and uncontrolled growth. Virginia did not develop any cities or even towns during the period 1625-1660. Indeed, the towns, such as Jamestown and Henrico, that had earlier been established, declined in population or were totally abandoned. The immigrants who were funneled into the colony through Jamestown were soon attracted to the ever widening frontier. During the first twenty years colonists had lived in organized farming communities, separated from other such settlements, but strictly supervised by local "plantation commanders." The separate settlements were variously called "colonies," "plantations," "hundreds," and "particular plantations," and sometimes contained hundreds of planters. Frequently the "plantation" was located within a loop of the James River. The members of the settlement planted their crops within the loop, and set up palisades and forts at the open end for their common defense. Sentinels and guards were provided cooperatively to man the defenses. As the settlers increased in numbers and the power of their governors and of the Indians to restrain them decreased, however, they tended to leave the organized communities and to carve out for themselves individual plantations in the wilderness. Thus, even while the population of the colony grew by leaps and bounds, the population of Jamestown and other areas where population was once concentrated declined. It was a process, one might call it, of de-urbanization.